Calibration Break-In Discs … Time to be nice. This is often more based on faith than any real evidence that these discs and test patterns actually benefit a new plasma TV at all compared to just using it in a responsible fashion. Is this really so hard to do? Out there in the enthusiast calibration world, places like CNET and certain calibrators that have developed quite a following have been sharing calibration settings with their readership and then some for years now. Unwitting enthusiasts have flocked to these places to look for some “cheap” quick fix solution to getting the best picture out of their new TVs. One even provides a set list of instructions on properly breaking in a TV by using a series of test patterns over the course of the first 100 hours of the panel. Of course the panel has already been on for many hours while still in the factory. After this break-in process, a series of recommended calibrated settings are used with the “promise” that people will have a calibrated TV exactly the same as if a professional were to come and do it for them, only free. This is a chance to get professional results without spending the time or effort or money to really learn how to do this stuff themselves. All they need to do is trust in the process. My own experience with hundreds and hundreds of plasma sets tells me that these so called procedures are a waste of time and don’t achieve some superior end result. I’ve worked on so many plasma displays that have been brand new out of the box and then I returned in 4 months to find virtually no change. Then I return in 6 months time further down the road to find an equivalent level of change to that first 4 months. There was never any sign of massive changes or fluctuations that occurred in that original four month time frame. The data just is not there. And in all cases as well, the slight calibration adjustments due to normal drift are still well beyond what any human being can perceive. Now enter the professionals into the arena that just happen to have access to two new Panasonic VT60 series plasma displays. One writes reviews for online publications (Chris Heinonen) and the other (Ray Coronado of SoCalHT) got the TV for his own enjoyment because the price was right and it was replacing a 54VT25 set in his home theater. A quick discussion with Ray about break in settings and he said that he would document the process to the letter and he convinced his writer/reviewer friend Chris to do the same. They also ended up throwing in the CNET settings for fun as well, in order to see what would happen with those numbers. Here is a link to Chris’ article about what they found with the copied settings and the whole break in test disc process. It pretty much validates yet again what good professional calibrators have been seeing for years and years. One of the reviewers (David Katzmaier) at CNET has even said something to the effect that the published settings on their site were to be taken with a grain of salt and was done to simply appease the ignorant masses that just kept asking them for their calibration numbers. The end result of what Ray and Chris found was that the stock THX settings in the TV, whether it was brand new or even after 100 hours, were still better than going through the entire break-in process and then feeding in the copied calibration numbers into the TV. If the TV was actually calibrated manually with proper instrumentation, then the end result would be even better and would at that time represent the best the display could get. The extra effort and time put in to use the break-in test patterns and the copied settings added nothing positive to the process. If anything, the end result turned out to be somewhat worse than the “doing nothing” approach that just selected the THX mode in the TV. 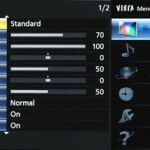 As shown in this article, the statistics show that copying settings has a less than 4% chance of resulting in a measurably better picture than the stock Movie / Cinema / THX / Pure modes found in the TV. Conversely a person has a greater than 96% chance of ending up no better than the stock settings or possibly even worse than the stock settings. Faith and hope still rule the day. I have no doubt that the copying will still continue because facts are often not enough to dissuade people from a course of action. With no way to verify the end result either way, it actually does not matter any more if they are in the 4% or the 96%. It now comes down to only the idea of preference versus reference. People just end up with an end result that they happen to like which has nothing to do with it being the correct result. So because they like it, then the process of copying calibrated settings and break-in test patterns actually works in their minds. Should people go to jail for stuff like this? Certainly not. It is just TV after all. But those that continue to perpetuate this myth do a great disservice to the industry by trying to pass off this stuff as science fact when the data clearly shows that it is nothing of the sort.